WILL TRAVEL special event: I am featuring a few special travel items for review and giveaway that I was able to use on my trip with my three-year-old son and eight-year-old niece this summer. Any of these items would make a fabulous Christmas gift or be ideal for holiday travel! Glitterful Felt Stories is offering my readers a giveaway of a travel flannel board and felt story of the winner's choice! Glitterful Felt Stories features incredible hand-crafted felt boards and story characters that are sure to spark your child's imagination. If you remember Flannelgraph stories from childhood Sunday school classes (anyone? ), this is similar in concept but in a child-usable size and child-oriented themes, generally from children's literature or songs. The felt characters stick to the flannel board and can be rearranged at will. 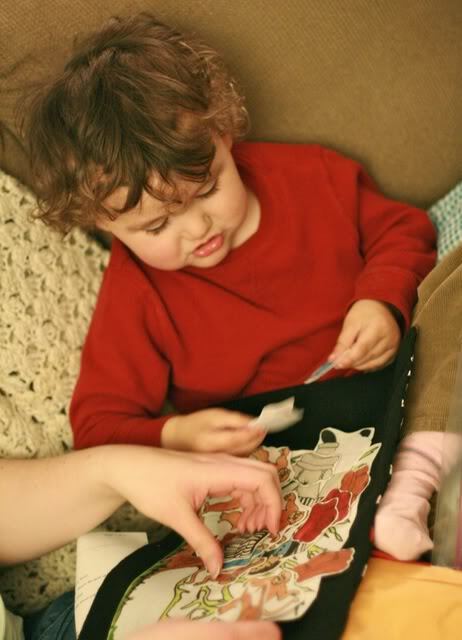 Felt boards make a wonderful tool to keep children engaged and happy during a long wait — such as on a trip, in a waiting room, or at a restaurant. 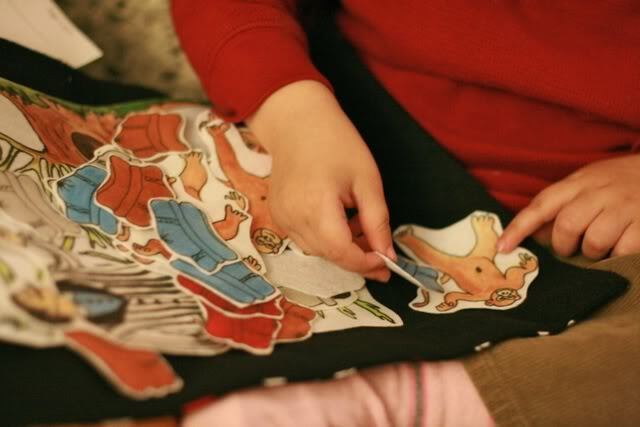 They also make storytelling fun, because it brings the characters to life, letting you or your children "act out" the story in a tactile and visually satisfying way. I actually won a Glitterful Felt Stories prize in another blog's giveaway (thanks, Katydid and Kid!). I was so impressed with the quality and care that went into making these one-of-a-kind pieces — and of the potential for child amusement on trips — that I contacted the owner, Shelby, and asked if she'd mind if I did a giveaway on my own site as part of my travel theme. As you can see, she agreed to give the same prize I won to one of my readers! When I received my travel board and story, I couldn't resist opening it right away instead of waiting for our trip. This almost proved fatal (ok, not really) — it's just that Mikko took to it so strongly I wasn't sure he'd let me put it away until the trip! He even loves wearing the travel roll like a cape (no, truly) with the ribbons that close it tied around his shoulders, flying around the house like some sort of pirate superhero. Yes, that's an unorthodox use of the travel board, but kids' imaginations are priceless like that. I love when a product is open-ended enough to allow for such diverse interpretations of use! Untying the portable travel roll. We chose pirates. Arr! The exterior, when rolled, is a fun fabric, and the other side is high-quality felt. The stitching seems really solid, and the fabric feels plush. You can roll the felt pieces up in the board and tie it with the attached ribbon so you can take your stories with you! The size of our travel board is 10.5 inches by 17 inches, so a perfect lap or airplane tray size, as I can attest. We went with Caps for Sale as our felt story. I simply couldn't resist, because Mikko has that book memorized and yells — no, seriously, yells! – "Caps for sale! Fifty cents a ca-aap!" the whole time you try to read it to him, which cracks me up no end. If you're familiar with the book, you can see Glitterful Felt really went all out on including every item you need to retell the story: the tree, the peddler, the monkeys, and all his colored hats, including his own. The only problem I have is fitting all the pieces on the travel board! Mikko puts a hat on a monkey. 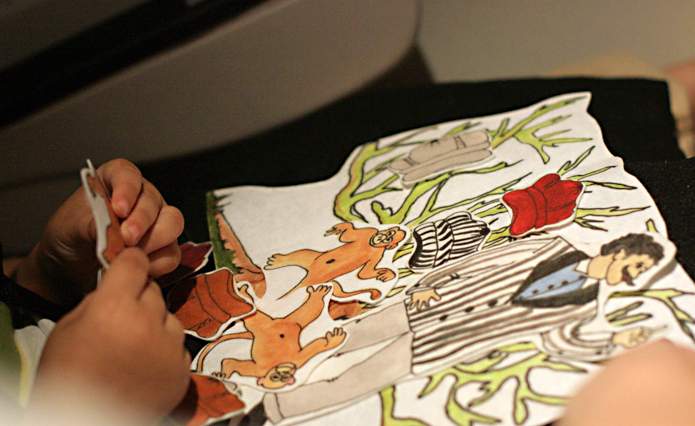 Here Mikko is, happily playing monkeys on the plane ride. Besides the folding travel boards, Glitterful Felt Stories also offers wall-hanging and aluminum-backed flannel boards for use in a home or classroom (or a home classroom). They would also be great for a library story hour or playgroup. 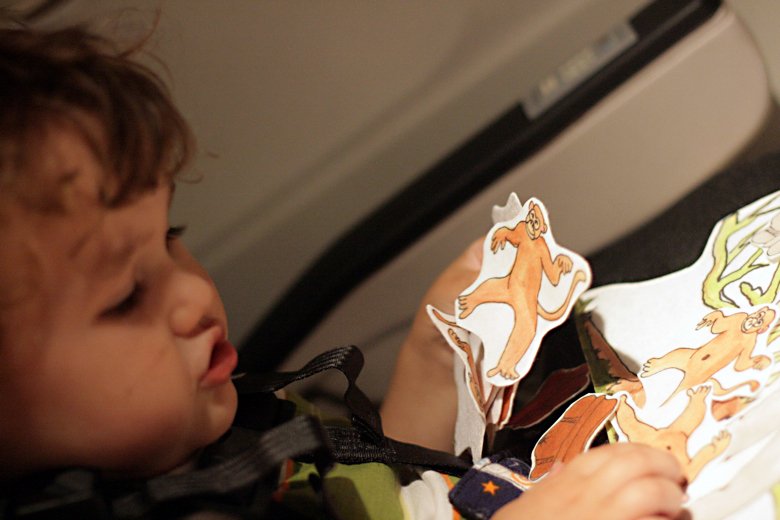 For most families, I think the patented travel boards would get the most use, because you could use them for storytime and then tuck them away; plus, you can bring them with you whenever you want a story and playtime on the go! They have some new larger-size versions if you get a character-heavy story as I did! Felt stories based on kids' songs, such as "An Old Lady Who Swallowed a Fly"
Fairy tales and other familiar stories such as "Goldilocks and the Three Bears"
And if I'm itching to relive my Flannelgraph days in earnest, there are religious and holiday-themed stories, too! 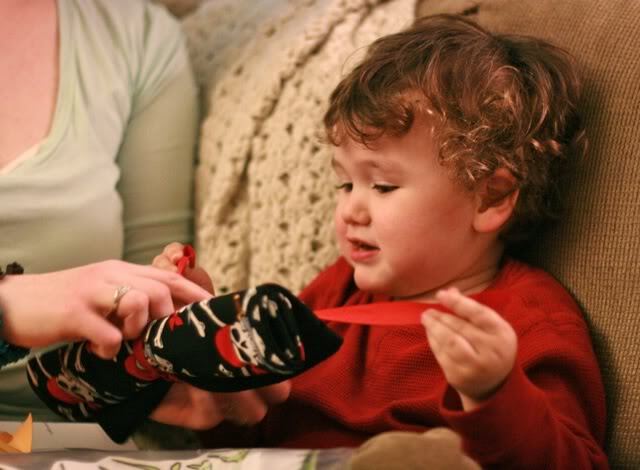 They even sell cute little glove puppets to make story or song time even more interactive! And I thought this was a marvelous idea for young children and particularly for children with special needs who could use a visual aid for performing routine tasks. 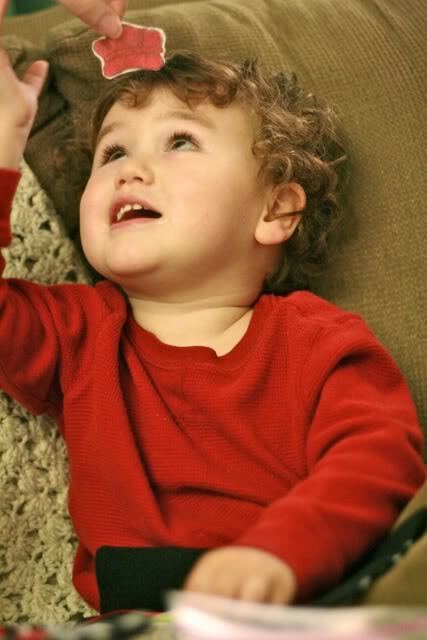 They offer Picture Learning Stories that outline the steps needed to complete a certain task, such as getting ready in the morning, going to the potty, or using good hygiene. Anyway, that should give you an idea of the wide range you'll have trouble choosing from if you win! You can buy any of these items online from GlitterfulFeltStories.com, FunFeltStories.com, or their Etsy shop. Portable folding travel boards are $12 for the regular size, $14 for the larger. Aluminum and wall-hanging boards range from $14.99 to $19.99. Felt stories generally start around $7.00 (although some are on sale for even less), and most are in the $10-$14 range, depending on complexity. Some of the felt pieces are "printed," so the pieces are a laminated and felted drawing (that's what our Caps for Sale ones are), and some are entirely cut out of felt and decorated with felt and glitter (hence the name!). I think they're all pretty dang impressive and seriously cannot imagine how they manage to make and sell such a variety at such low prices. Glitterful Felt is family owned and operated by Shelby Barone, a former preschool teacher and mom to three young children, and three employees. Seriously, how do they make these custom products so fast and so professionally? It's a mystery to me! Shipping in the U.S. runs $9.95 for a felt board, $2 for one story and $0.50 for each additional story, plus a $1 handling fee. There is free U.S. shipping on orders over $50. If you sign up for the newsletter, you'll find they often offer shipping promotions and free stories with purchase. International shipping starts at $5 for one story and $0.50 for each additional story. MAIN ENTRY: Visit Glitterful Felt Stories (or any of the other shops mentioned above) and tell me which felt story you'd love to win! I'll warn you, it's going to be tough to choose. Let me know your favorite portable travel board (not the new large size but the regular). Heart the Glitterful Felt Stories shop on Etsy and leave me your Etsy user name in the comment. Let me know how you will use this felt story if you win. Subscribe to the FeltStories.com blog in a reader or email, or become a follower through Google Friend Connect (1 entry for each). Follow @glitterfulfelt on Twitter and leave your Twitter name in the comment. Like Glitterful Felt Stories on Facebook. Enter another of my current giveaways or the giveaways on Natural Parents Network (1 extra entry per giveaway — check back for more, because they are coming soon). 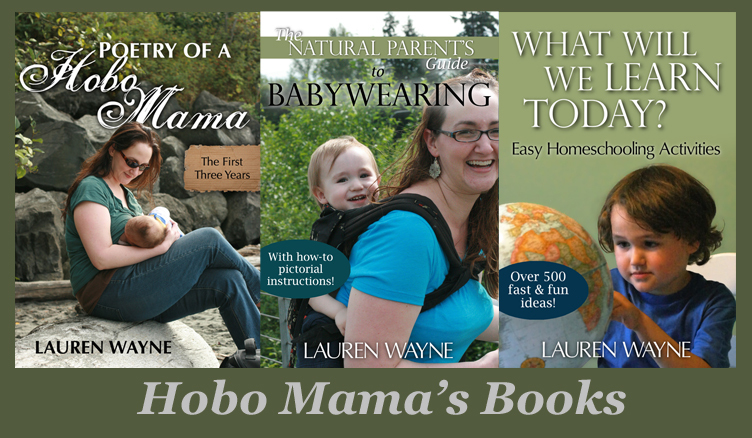 Put my Hobo Mama button on your website or add http://www.HoboMama.com to your text blogroll for 2 extra entries each. The HTML code for the button is in the sidebar. Leave your site URL in the comment so I can visit. Contest open to United States street mailing addresses only. Contest closes December 1 at 11:59 p.m. PST. and travel board as a giveaway prize. If I win, I will use this with my daughter. I like the Old lady who swallowed a fly set. These are great! And you're right - hard to pick one! I'll go for the Chicka Chicka Boom Boom felt story! My almost 3yo son would be playing with this! Sub'd to NPN by email. Sub'd to Hobo Mama Reviews by email. Sub'd to Hobo Mama via email. Like Hobo Mama on Fb. And...I like the shark portable travel board. Ahh my main entry didn't post first. One of my kids favorite books was the Kissing Hand when they were younger. I think they would love to use it with their old book to read totheir new baby brother. my son would use it. He loves to be creative. we are right now reading this story at least 3 times a day. this would be cool addition. Liked Glitterful Felt Stories on Facebook. Liked Hobo Mama on Facebook. Liked Natural Parents Network on Facebook. I would use this for long drives in the car and also at the Doctors office. I like the Three little pigs one. A Caterpillar Felt Board Story. So cute! They are all so cute! I think I'd pick either the Caterpillar Felt Board Story or An Old Lady Who Swallowed A Fly Flannel Board Story. We love the Old MacDonald story board. I'd either choose the Upper and Lowercase match or the Ice Cream Counting Flannel Board Felt Board Story...but,it's hard to choose,I love them all! I would choose the Chicka Chicka Boom Boom set, my 3 year old is very interested in learning ABC's right now. The football board and the fleur de lis is my favorite! The Cowboy print and the Frog print portable folding boards are cute! I will use this felt set for traveling, doctor's visits when we're stuck in a waiting room, and for a fun preschool day activity. I entered your Giggle Junction's I Spy giveaway! There were ten in the bed and the little one said...move over, move over. 10 in the bed would be so much fun to sing and play with my upcoming grandchild. Oh, and you have my email or can reach me through my blog, of course. Here is entry #2: I have a thing for flames, but the pirates are SO cute. I think for us I might have to choose the frogs... not sure why. Maybe it is that lovely shade of green combined with pink. I liked Glitterful Felt Stories on FB. I already like Hobo Mama on FB! I already like NPN on FB! I have the Hobo Mama button on my blog. I love the Noah's Ark storyboard! We will use the flannel board for story telling, teaching something new (even a new story), and airplane travel! My son totally loves sharks right now, so my favorite portable travel board would have to be the sharks board. Follow HoboMama Reviews on Google. Oooh! So hard to choose, but I'll go with Caps for Sale as well, we LOVE that one! I follow NPN on twitter! I have the NPN badge on my blog! Whoops, just adding 2nd entry due to NPN button. 2nd Entry for linking to HoboMama on blogroll! Noah’s Ark "Printed" Felt Board Story. I hearted them, user name gkran. I will use it to teach my kids Noah's Ark story. I know the contect just ended, but I wanted to say that I too remember the flannel boards from childhood Sunday school classes. I was search from them for my homeschool classroom & ran across your give away. :) Thanks for sharing! !